Where adventure lives in North Devon. Get Your Questions – Answered! 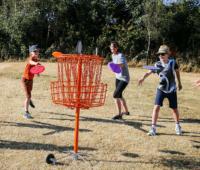 Here are the answers to some of the Ultimate Adventure Centre frequently asked questions. Check out the information below to find out more about our outdoor pursuits centre and activities in North Devon. We hope to answer all of your queries in enough detail below, but if we miss anything please don’t hesitate to contact us. Booking is advised for all our activities and for the Ultimate Day Out, although tickets will be available on the door. Booking is necessary for The Ultimate Assault, Aerial Adventure, High Ropes, Mountain Boarding Lessons, Coasteering, Kayaking, Surfing, our Accommodation and all groups over 6 people regardless of activity. You can find links to book on each activity page. There are a few different ways you can book activities. The simplest and quickest route is using the online booking system, linked to from each activity page. You can also call our booking line on 01237 880028 or e-mail us at info@ultimateadventurecentre.com. The Ultimate Adventure Centre is we open daily from 10am – 7pm during the Summer Season (June – August). We are only open at weekends during April, May, September and October but we do open during the week for group bookings and residentials. Session timings depend on the activity so check each activity page. 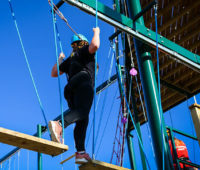 We have pre-bookable sessions for all of our on-site activities – The Assault, Awesome 4 Some, High Ropes, Mountain Boarding Lessons, Climbing Wall, Kayaking and Stand Up Paddle Boarding. There are limited spaces on each activity session. Spaces can booked in advance on each activity page. If you decide to turn up on the day, activities are subject to availability. Coasteering, Kayaking, Surfing are all dependant on tide times. Contact us for further information on session availability and times. How Much Earlier do we Need to Arrive Before our Activity Start Time? We ask that you arrive 15 minutes before your activity start time. This is so that we can get you registered and ready to begin your activity on time. We cannot guarantee participation if you arrive after your session start time. Can I Try an Ultimate Adventure if I’m Under 18 years Old? Under 18s need to be supervised for every activity. Each activity has different age and competency criteria so check out each activity for more information. Will my Session be only my Group? Depending on the size of your group, you may or may not have a private session. Our Ultimate Assault & Awesome 4Some have a maximum of 30 people per session, so if your group size is smaller than this, there may well be other members of the public on the same session as you. Ultimate Assault, Awesome 4some, Laser Tag and Surfing sessions run for 2 hours, High Ropes is 1 hour long & Climbing is 30 minutes. Coasteering last for approx 2 1/2 hrs. Water Zorbing & Rifle Shooting sessions usually last 10 minutes each. My Child Wants to do an Activity, Do I Have to do it As Well? No! We cannot accept ‘in loco parentis’, and so we ask that if your child is under 18 years of age a parent or guardian must remain on site at all times. What do I Need to Wear for the Activity? This is totally dependant on the activity you are doing. Further information can be found by clicking on ‘Joining Instructions’ page. Are Spectators Allowed on Site and Do They Have to Pay? We welcome the whole family to come and spectate free of charge. Our Cafe allows spectators to relax with a hot beverage whilst watching the rest of the family take part in their chosen activity / activities. Can I Bring My Camera / Camcorder? Usually this is not a problem. However, from time to time, when we have multiple groups on site, there may be occasions when photography is not permitted. We will let you know on the day when you arrive if this is the case. Are There Any Changing Facilities on Site? We have changing, storage facilities and toilets on site. For more information on our facilities go to our Site Facilities page. Do I need to Bring any Paperwork? You will be sent a booking confirmation provided to you at the time of booking. Please bring this on the day. Activities run in all weathers, although some aspects (e.g zipwire) may be affected by the weather. The High Ropes course remains open in all weathers, except when it is icy, during high winds or during lightning. Don’t forget to dress for the weather. Is The Ultimate Adventure Centre Insured and Licensed? The Ultimate Adventure Centre has £5 million public liability insurance. We are licensed by the Adventure Activity Licensing Authority (AALA) and are DCC Approved. What happens if I have a Pre-existing Medical Condition? Although our staff are first aid trained, they are not medically qualified and so are not in a position to assess the capacity of participants to undertake a course. It remains your responsibility to undertake such an assessment prior to starting any activity. We advise you to visit the course prior to booking to undertake your own risk assessment. You may also wish to contact your doctor for further advice. Can I do the Activities if I’m Pregnant? We recommend that pregnant women do not take part on the course as it is a robust aerial adventure and therefore, there are associated risks. However, we do not want to be discriminatory and ultimately the choice is yours. We are not medical experts and therefore suggest that you seek advice from your doctor on the matter. If you decide to proceed, you will need to declare that you are pregnant and then sign a disclaimer stating that: “I have made The Ultimate Adventure Centre aware that I am pregnant and as a result The Ultimate Adventure Centre has recommended that I do not take part on the course. However, I have decided to take part on the course in the full knowledge that this may incur risks to my unborn child”. With pleasure! However we do also have cafe facilities on site. You will be able to view The Ultimate Assault from the comfort of this building & balcony. Are Dogs Allowed on Site? Yes we provide dog friendly accommodation, dogs are very welcome as long as they are well behaved and kept on a lead at all times. We’ve got thrills, spills and fun for the whole family. Grab your tickets online now! Or better yet, give us a call on 01237 88 00 28. We’ll be happy to give you all the information you need. Lines are open 9.00am until 5.00pm.